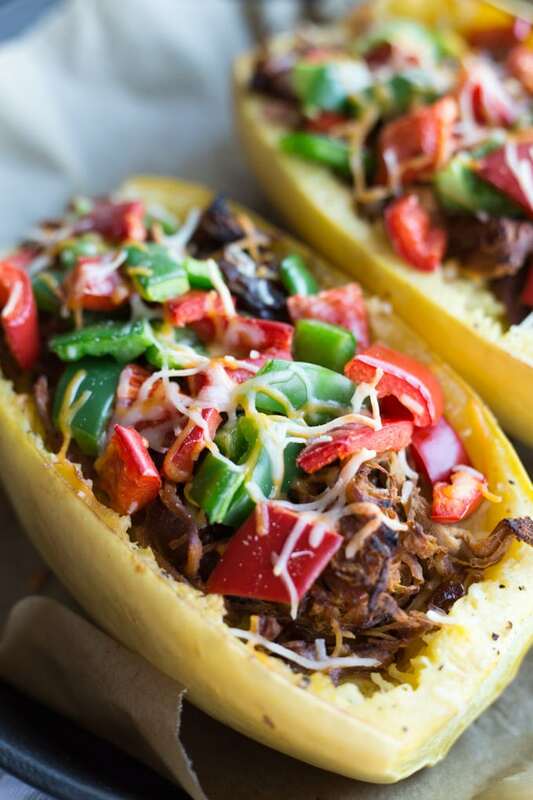 Keeping it clean and easy today with this Maple Pulled Pork Stuffed Spaghetti Squash! Okay, before we get into today’s recipe, I just have to say that I can’t believe this is the 50th recipe I’m sharing on Crumb Top Baking!! When I first decided to start a food blog a year ago, I had no idea where to start, or even if I would stick with it. 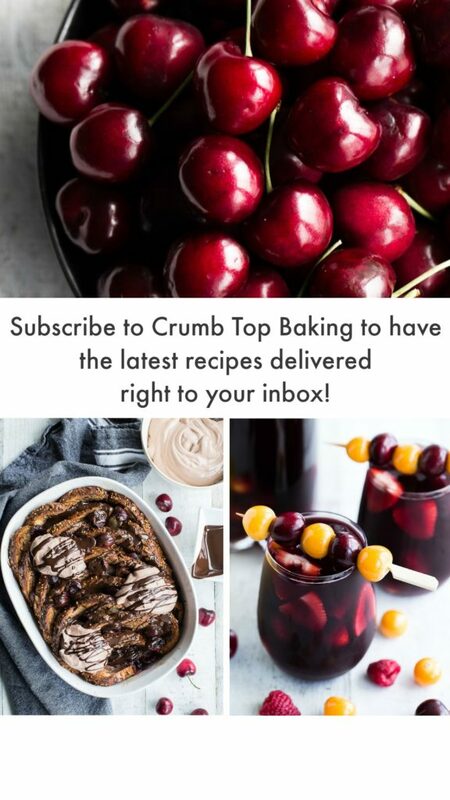 But almost 8 months after launching Crumb Top Baking, I can honestly say I’m having so much fun with it! There are so many elements to running a blog (some of which are not so fun), but my favourite part continues to be the recipe creation process. Okay, the food photography is a close second 😉 ! And it makes it all the more fun to be able to share my recipe creations with you guys. So whether you provide feedback here, on Instagram or Facebook, or even in person, I just want to say thank you! Thanks for visiting, thanks for making one of my recipes, and thanks for your overall support! You’re the best! 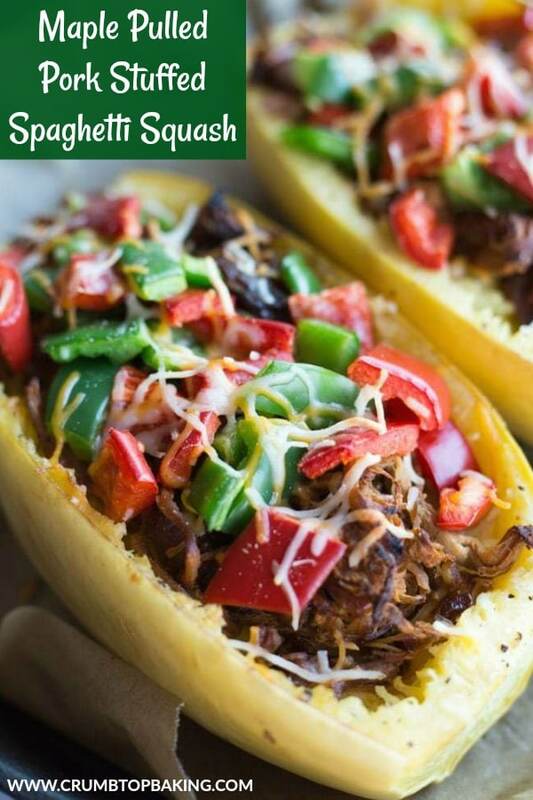 So now that the mushiness is out of the way, let’s move on to today’s recipe for Maple Pulled Pork Stuffed Spaghetti Squash! This is one of those recipes to file under easy and family pleasing. While it takes about 4 hours to see this recipe through from start to finish, it doesn’t require a lot of work. That’s because one of the best things about roasting squash and slow cooking meat is that you really don’t have to pay attention to it. You just put them in the oven and/or slow cooker, and forget about them. Okay, I set a timer, but at least I don’t have to constantly check on them 😉 . So the maple pulled pork for this recipe has been on repeat in our house for the past 10 days. And that’s not because I was trying to perfect the recipe. It’s because we’ve been adding it to everything! Aside from spaghetti squash, I’ve been adding it this balsamic roasted beet salad, and my husband has been using it for sandwiches and as a pizza topping. 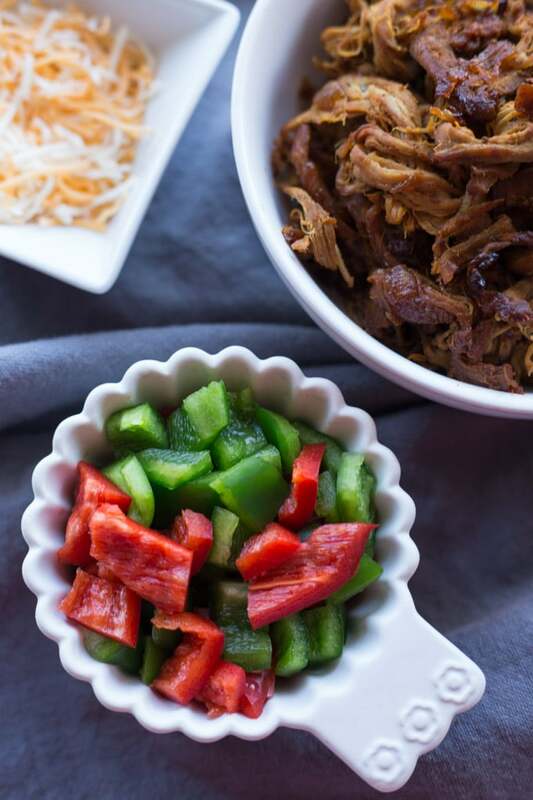 The maple pulled pork is a pretty easy recipe to prepare in the slow cooker. I just coat the pork with a smokey spice mixture consisting of garlic, cumin, chili powder, smoked paprika, salt and pepper. And I slow cook it with a chopped onion and a maple syrup/mustard/vinegar mixture. 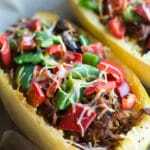 The result is a sweet and smokey pulled pork that is a bit caramelized and perfectly tender. So good! To prepare the spaghetti squash, I just cut it in half, scoop out the seeds and drizzle with some olive oil. You can season it however you like, but I usually keep it simple with salt, pepper and garlic powder. Then, I just roast it for 30-40 minutes and when it’s cooked, I scrape through the flesh with a fork to create spaghetti noodles. You can scoop it out or leave it in the skin for a stuffed squash. Once the pork and squash are ready, just assemble and bake. By assemble, I mean add the shredded pork to the top of the spaghetti squash noodles. Load on some red and green pepper (and other veggies if you like), add a bit of cheese and bake for about 15 minutes. Dinner is served! 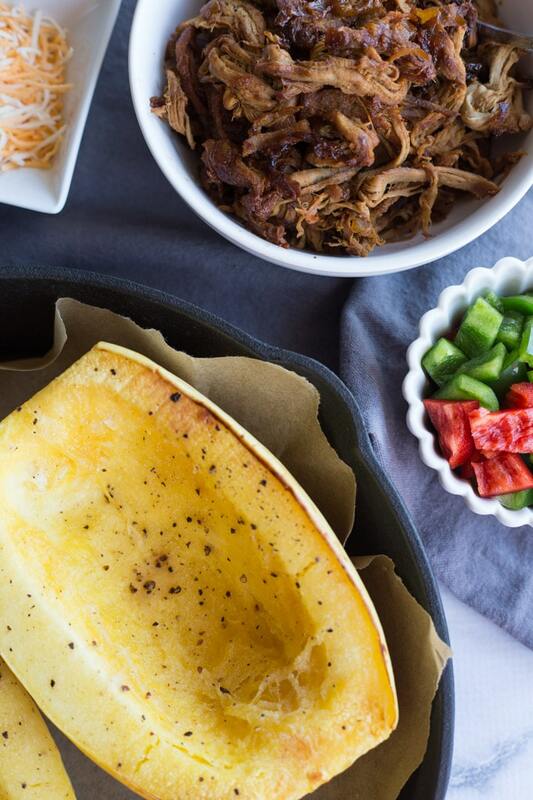 This recipe for Maple Pulled Pork Stuffed Spaghetti Squash is enough for two. But the recipe can easily be doubled to feed a family of four, or to make ahead for weekday lunches (because this dish heats up perfectly in the microwave)! If you make this, be sure to let me know what you think in the comments below, or on the normal social media channels! Enjoy the rest of your week! Spaghetti squash noodles topped with sweet and smokey pork, loads of red and green peppers and a sprinkling of cheese. 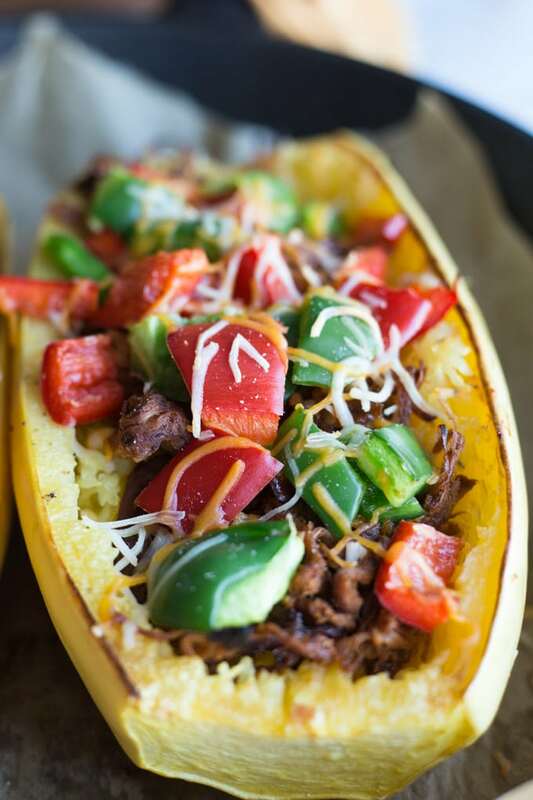 This Maple Pulled Pork Stuffed Spaghetti Squash is easy, delicious and just the perfect weekday supper! Maple pulled pork: In a small dish, whisk together the maple syrup, mustard and vinegar. Set aside. In another small dish, combine the garlic powder, cumin, chili powder, paprika, salt and pepper. Coat the pork tenderloin in the spice mixture. Add the pork, maple syrup mixture and chopped onion to a slow cooker and cook on high for 3 hours. (Don’t forget to grease the slow cooker with non-stick cooking spray). Once cooked, shred the pork in the slow cooker and mix it in with the remaining maple syrup mixture and onion, most of which will be caramelized. Stuffed spaghetti squash: When the pork is almost cooked, start preparing the squash. Pre-heat the oven to 400 degrees and line a baking sheet with parchment paper. Cut the ends off the squash and then cut in half (lengthwise). Scoop out the seeds and brush the flesh with olive oil. Season with the salt, pepper and garlic powder. Place the squash face down (skin side up) on the prepared baking sheet and roast for 30-40 minutes, or until a fork can easily pierce the skin and flesh. Assembling the stuffed squash: Once the squash is cooked, remove from the oven and let sit for 5 minutes, or until cooled enough to handle. Scrape through the flesh with a fork to create strands, which will look like spaghetti. Keep the noodles in the skin and add the pork, red and green peppers and cheese to the top. Bake for 15 minutes on 350 degrees, or until the stuffed squash is heated through and the cheese is melted. Store any leftovers in an airtight container in the fridge and enjoy within 2-3 days! I like to cook the pork on high for 3 hours until there is no liquid left in the slow cooker. This allows enough time for the maple syrup mixture and onions to caramelize. So don’t be alarmed if all the liquid is absorbed and cooked off. If you don’t have a slow cooker, you can cook the pork on 300 degrees in the oven for about 1.5 hours, or until the pork is cooked through. It won’t be as tender or as caramelized as if it were cooked in the slow cooker, but it will still be delicious. This recipe works best with a pork tenderloin but I’ve also made it with a pork loin roast or pork loin centre chops. It doesn’t shred quite as easily, but it still works well. I usually cook a small tenderloin (1 – 1.5 lbs), which I find is enough to feed two people. If you have a larger tenderloin or more than one squash, just double the recipe. I’ve been enjoying spaghetti squash like crazy lately too! I have one to share with ground turkey. They are super filling, aren’t they? And totally guilt free in my opinion 😉 Love this one with maple pulled pork – there is no going wrong there! Thanks Dawn! Blogging is definitely an adventure. But you’re absolutely right. The blogging community is an awesome group of people! Spaghetti squash is super filling, and paired with this pork, it’s a big meal! I’m always looking for new ground turkey recipes, so I can’t wait to see your spaghetti squash recipe! This looks amazing!! I love the sweetness from the squash mixed with the savory maple pork filling. Yum! Take care. Thanks Stacey! The sweet and smokey combo in this dish is amazing. And the pork is definitely making its way into my weekly meal rotation! We are both blogger newbies so it’s really fun to watch and read about your evolving story too! It’s such a crazy world, this food blogging business! I have an affinity for stuffed squashes, and this one is definitely going on my must-make list. Love the looks of that pork!! Thanks Katherine! Food blogging is definitely a different kind of business. But it’s so much fun trying and learning new things with it everyday! As for this recipe, I hope you get a chance to make it! The pork is delicious 😉 . Oh I wish I could enjoy the photography part of blogging. It continues to be my biggest struggle! Congrats on 50 posts, Leanne :). That’s awesome! And this sounds delicious, too! Thanks Kelsie! I still struggle with the photography too! But I’m learning so much along the way, and seeing progress, so that makes it pretty fun! Congrats on your 50th recipe Leanne! And what a delicious one it is! 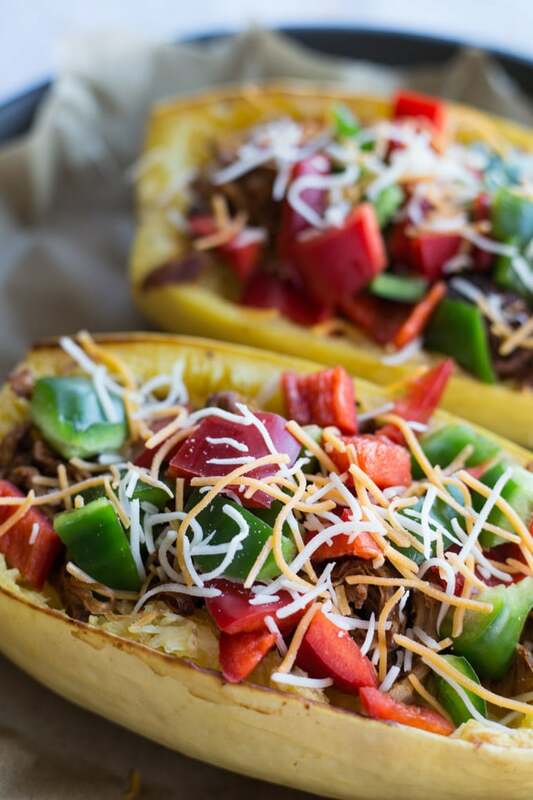 I love spaghetti squash…especially when it’s stuffed with pulled pork! Count me in! Thanks Mary Ann. I can’t believe how quickly I got to 50 recipes! And this one is a definite favourite of mine. The pulled pork has been on repeat in my house lately. So good! Enjoy the rest of your day!